I got a great book for Christmas called “The Handmade Soap Book” by Melinda Coss which contained a recipe for cocoa butter based bath melts. The recipe was donated to the book by Lush, and I thought I’d add it to the site because they are very easy to make. The recipe below is a slight modification of the original. 85g/3oz of cocoa butter (great skin softener). I get mine from purenuffstuff.co.uk as it’s very reasonably priced. Measure out your ingredients: These quantities made 5 round melts 60mm wide and 12mm thick. Add to pan: Put all the ingredients except your essential oils (and/or peel) into a pan. Heat gently: You do not want to boil your ingredients, just heat it enough to melt the cocoa butter and the creamed coconut together. When your mixture turns into a yellow semi transparent liquid (a bit like melted butter), take it off the heat. 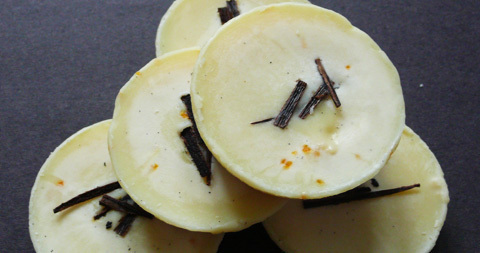 Add fragrance: Add your essential oils and or peel – I also added in a few vanilla seeds but these are optional. Tip into moulds: I used fairy cake baking tins (lightly greased with olive oil) as I didn’t have anything flexible. The original recipe suggested ice cube moulds. Put in the fridge to set: Once your melts have started to get a thin skin (takes around 20 minutes) on top, you can add some decoration. I added some vanilla seeds to my mixture and then the cut the pod into thin strips and placed on top for decoration. Once you have done this return them to the fridge to set overnight. Although your melts will appear set very quickly, they need to stay in the fridge overnight so they are solid all the way through and don’t break when they are removed from the mould. Remove from moulds: If you have used a non flexible mould like me, you may need to put the bottom on the tray in some warm water to loosen them – but only for a few seconds. Store: These start to melt when they come into contact with heat, including hands. They are therefore best stored in plastic wrapping. These melts make great gifts as they can be decorated with petals, peels and seeds and are ideal for soothing dry skin. As a psoriasis sufferer I found these bath melts to be very soothing to my skin. I also found they helped alot with the inflammation. I will be recommending this recipe to other psoriasis sufferers! I don’t think leaving out the coconut would matter. I usually get my cocoa butter from Pure Nuff Stuff: http://www.purenuffstuff.co.uk/do-it-yourself/cocoa-butter.htm. Good price and always arrived quickly. It also comes in ready broken up chunks so you don’t have to fight it out the tub. That sounds lovely! I’d never tried the Lush bath melts until I made the recipe in this book, but now I’m hooked ;) I left the desiccated coconut nut out of my last batch and I think I preferred it a little because there were fewer bits to clean up after my bath! Hi Dorina, what type of honey did you use? I used runny honey and that seemed to do the trick. It could be that you need to use a little less honey, maybe 1/2 tablespoon. how many melts does this recipe make? This makes about 6 medium sized bath melts – I put mine in a fairy/cupcake baking tin and filled each mould about half way up – you don’t want them to be too big or your bath will be very greasy! You can make them smaller if you need more melts. does this recipe work with half the quantities because i dont want to waste the ingredients? Yes, you can use half quantities aswell if you want a very small batch.